Every holiday season, confused dads, moms, wives, husbands, brothers, sisters, girlfriends and boyfriends come to TXBA shopping for the guitar player in their life, with only a vague idea of what to shop for. "I think he likes Jimi Hendrix... do you have that?" Well, shopping for your favorite guitar player just got a lot easier. 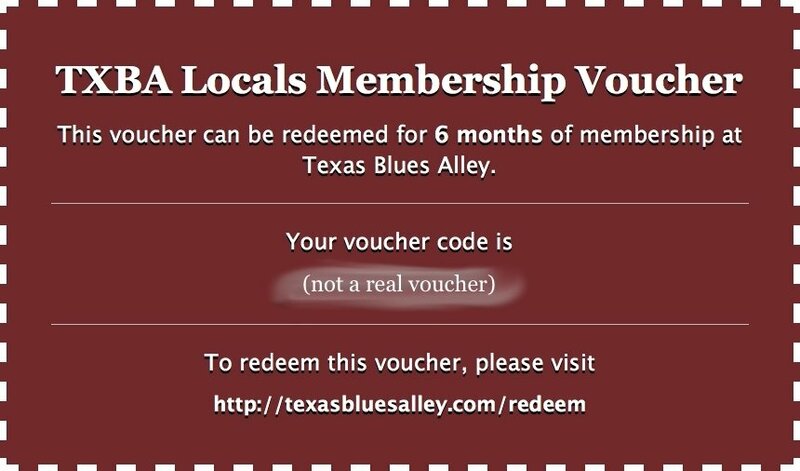 A membership voucher is the perfect gift to buy when you're not sure what your favorite guitar player wants from Texas Blues Alley. When he/she redeems the voucher you've purchased for them, they'll be enrolled in our TXBA Locals program where they'll have online streaming access to every TXBA course 24/7. You don't have to worry about buying the wrong course because they'll have access to everything. Their membership will last until the voucher expires. In this example Steve is the gift buyer, and his brother Dan is the guitar player. Brad picks how many months of membership he can afford to buy a voucher for. Brad pays for the voucher, and gets a special redeem code to print or email. Brad waits until the right time and gives the voucher redeem code to Dan. 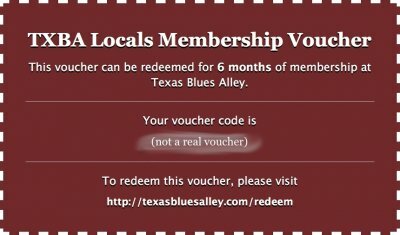 Dan visits the voucher redeem page at TXBA and enters the code. Dan is now a member of the Locals and soon realizes how slowly he was learning before. If you're the gift buyer, just visit the voucher purchasing page to get started. If you're the guitar player who wants a membership voucher as a gift, just click the button below to send a customized email to whoever is shopping for you, requesting a voucher as a gift.